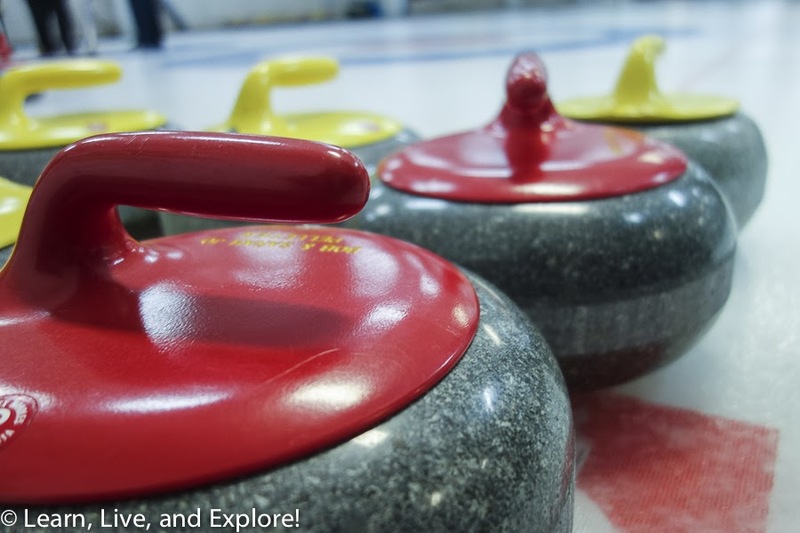 Winter Olympic Fever: Learning to Curl ~ Learn, Live, and Explore! Despite my having attended the London Summer Olympics in 2012, my preference has always been for the Winter Olympics. I love all of the skiing, and I am especially enamored with the new ski slopestyle event and the young American guys who swept the podium. Then, of course, there's the ice skating - who doesn't love watching that? 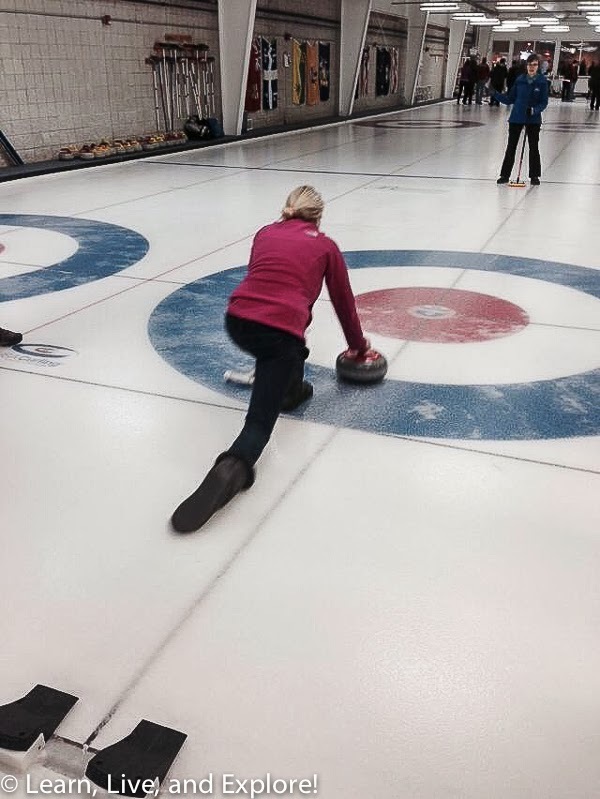 One of the sports I have never really understood, though, was curling. 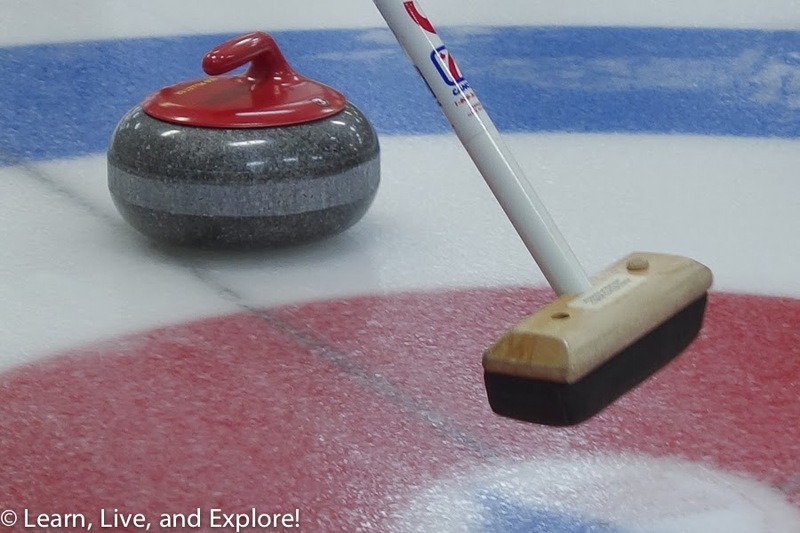 So, to be a part of the Olympic action, I headed up today with a friend to the Potomac Curling Club open house event to learn more about ice shuffleboard...ahem, I mean curling. The first thing we learned is that it is darn slippery on the ice! The actual club members doing the instruction were wearing special shoes with a teflon coating that removes even more of your grip but makes it easier to glide on the ice for the stone throwing and the sweeping. After getting a feel for the stones, we actually got to try to throw one down the alley (or whatever they call it) to the "house" or target. Even with a PVC pipe contraption to assist with our balance, throwing the stone was really hard. And you don't get a real understanding of the length of both the throwing section and lane as a whole on the TV broadcast, nor do you realize the balance it takes to glide through the throwing motion. I have a much better appreciation for the difficulty of this sport after today. As for sweeping, well since we didn't have much control with our throws, the ones I was assigned to sweep traveled way too fast, thereby defeating the purpose of sweeping the ice. On some other, shorter practice throws though, I did do a little sweeping, and it's definitely tiring even at that distance. I can't imagine doing it for the entire lane! So, am I a contender for the 2018 Winter Games US Curling Team in Pyeongchang...the odds are low, but there's always a chance!